One of the Swineford workhouse’s most notable inmates was Michael Davitt, from Straide, County Mayo. At the age of four-and-a half, in 1859, Davitt entered the workhouse for a short time with his destitute Mother, because of arrears in their rent. 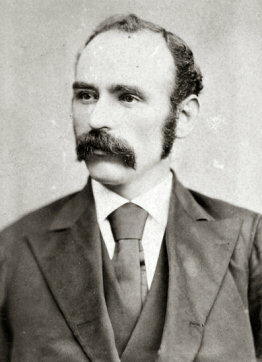 years later, in the 1880s, Davitt was a founder and also chairman of the Land League – an agrarian protest organization in Ireland. He later entered Parliament, and was an eminent socialist campaigner, writer, and lecturer, his views undoubtedly owing much to his childhood penury, including his time as an inmate at Swinford Workhouse. The means to effect social change was also created in Ireland and one Charles Boycott was the first well known means to ostracizze a community member, was established in Ireland, when the local community refused to help Boycott who was an Agent for Lord Erne (John Crichton, 3rd Earl Erne), a landowner in the Lough Mask area of County Mayo work the Farm and harvest crops estimated the harvest (by 1000 troops and other Protestant members from the North of Ireland) cost the British government and others at least £10,000 to harvest about £500 worth of crops, because of Boycott’s treatment of tenants of the Land (often the poorest of the poor) such as he had laid down many petty restrictions, such as not allowing gates to be left open and not allowing hens to trespass on his property, and that he fined anyone who transgressed these restrictions. Boycott also withdrew tenant’s privileges (such as collecting wood from the estate). In August 1880, his labourers went on strike in a dispute over a wage increase. This was the start of Boycott’s problems, well deserved due to abuse of the local community laborers that were employed — which caused almost the entire Community to refuse to deal with, talk to, or otherwise provide Labor to Boycott to the point He could not function in his Employment by Lord Erne, and was unable to run the land as the above note about harvesting crops at a cost 100 x the value of those crops (which presumably Boycott did not pay for as the Military eventually supplied the labor by troops and members of Northern Ireland).